Arezzo has a very ancient history. Since prehistory its area was inhabited first by the Umbrians, then by the Etruscans, by the Romans, by the Lombards and finally by the Tuscans. In the Middle Ages, like other Tuscan cities, Arezzo saw the transfer of its regency from Church dignitaries (Bishops-Counts), to the Municipalities (Assemblies of citizens), to the Lordships (Principality of the Florentine Medici family), to the Austrians (the Archduke Francis I° of Lorraine), to the French (Napoleon Bonaparte), to the Austrians again (Principality of the Lorraines), and finally to the Kingdom of Italy with the annexation in 1860. 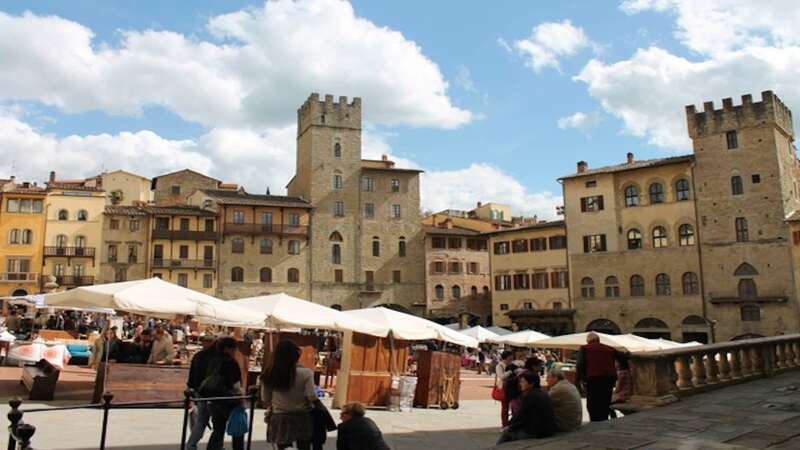 The culinary history of Arezzo is similar to the one of other cities of Tuscany: there were big differences between the sumptuous banquets reserved to the religious and the nobles and the frugal cooking of the population. Cuisine for special occasions was full of any sort of meats, vegetables, fruit and wine; the rural population, on the contrary, lived simply and with very few resources, so it had to sharpen its wit in order to prepare good dishes with the little it could get. In the past, peasant families of Arezzo gathered in the farmyards or in the stables in the evening, before the fire, to discuss their problems: during those meetings each of them was carrying a piece of meat from their stables or from the henhouses, in order to permit to the mistress of the house to cook all that meat toghether with tomatoes, herbs and bread “abbrustolito”: this simple recipe was called “Scottiglia” or “Caciucco of the Casentino”. Another typical recipe of Arezzo is the “Buglione”, which is a soup of meat scraps (snouts, necks, paws) that are stripped and cooked, combined with a sautè of vegetables, simmered long adding broth until creamy and then spread on slices of toasted bread. Do not forget the famous “Fegatelli”, pig’s liver forcemeat with crushed fennel seeds and bay leaves, cooked in the oven, or on a spit; the hot soup of Tarlati, a powerful Bishop who lived in 1300 AD, made with chicken, onion, carrot , celery, bay leaves, flour, butter, cream, salt and pepper; the meat “Fricassee”, with the addition of well-beaten egg yolks and lemon, poured on the bits of cooked meat; and more, pheasant with truffles, grilled lamb, spit-roasted pork, Pappardelle with hare gravy, tomato mush, cabbage soup. Finally, a typical product that has to be quoted is the walnut of Arezzo, which you absolutely have to taste when you arrive in this beautiful city.